My friend and I attended the Powerbooks Brand Relaunch event at Greenbelt 4 last June 1, 2010. Me and my friend really loves reading books. Known people and celebrities, like father and son, David and Powie Celdran, Magic 89.9 DJ Mojo, Sara Black, Tambunting siblings (Nacho and Ines), blogger Cecile van Straten, Joey Yupangco, Tim Yap and Tessa Prieto-Valdez were there to show the books of their shelves.Press people and book lovers were also present at the event. 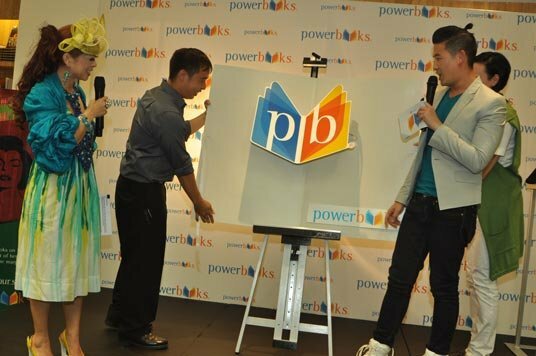 One of the highlights of the event was the introduction of Powerbooks’ new logo. Another thing, I was able to answer a question and won two (2) Powerbooks journal for the trivia contest. QUESTION: What are the names of the four (sisters) in the book, Little Women written by Louisa May Alcott? Of course, they are Meg, Jo, Beth and Amy! I was able to remember their names because I have already read that book when I was young and I even watched its cartoon series. As part of the event, there was a 20% discount promo for every book that customers buy.